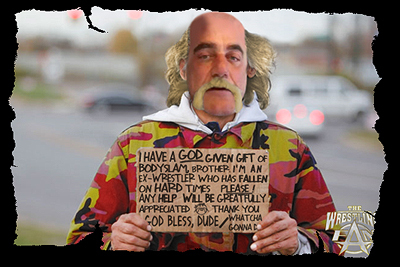 Headlies: US HERO WITH GOLDEN TRUNKS BECOMES HOMELESS MAN / DIXIE CARTER “SURPRISED” TO FIND TNA DVDS IN FYE BARGAIN BIN / TUPAC-BIGGIE FEUD BEGAN OVER STAR RATING DISAGREEMENT - WrestleCrap - The Very Worst of Pro Wrestling! Orlando, FL – Once a national icon who inspired millions to train, say their prayers, and eat their vitamins, semi-retired pro wrestler Hulk Hogan has become the new, American riches-to-dew-rags cautionary tale. Hulk Hogan enjoyed mega-stardom in the mid-1980s and early 1990s as part of the World Wrestling Federation, where he achieved awe-inspiring feats of strength such as bodyslamming a 700-pound Andre the Giant– a feat that not only ultimately led to Andre’s death weeks later, but to global warming, the election of George W. Bush in 2000, and season 2 of A Shot at Love with Tila Tequila, as well. Hogan, 57, is now homeless and desperate for work after a short few years of having his hard-earned money and a solid gold toilet seat siphoned from him by a greedy ex-wife. The repercussions of having a painfully stupid son and a largely talentless daughter only helped to exacerbate Hogan’s current predicament. Researchers at TheSmokingGun.com revealed a bombshell this week; that Hogan has a lengthy criminal history, something that no other hobo in American history has ever had. He became addicted to Hulkamania in 1983 and had been arrested for possession of Hulkamaniac paraphernalia countless times, eventually pleading No-Contest, and one double-disqualification. He said he has been clean for six weeks (or a matter of hours in our time). Hogan was discovered early last year by a man named Eric Bischoff, who previously sold meat from the back of a truck in Minneapolis, MN. Since becoming an internet and TV sensation after a video that demonstrated his amazing ability to bodyslam incredibly heavy objects garnered millions of hits on YouTube, Hogan has come across numerous job offers from Rent-A-Center and, well, that’s it. Still, he feels remorse every day for not seeking the help he desperately needed decades ago/pinning Randy Savage one more time when he had the chance. 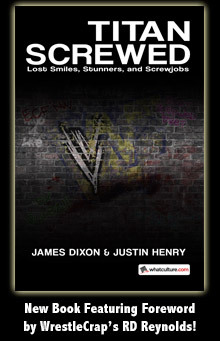 Hendersonville, TN – A recent shopping spree ended in bewilderment for TNA owner Dixie Carter. Carter was enjoying a day of clothes shopping with some friends, when a stop into FYE at the local outlet mall yielded an eye-opening discovery. “WPY”, it turns out, means “we’ll pay you”. Carter’s discovery apparently left her friends feeling sorry for her. Los Angeles, CA – The East-West rap wars of the 1990s provided the world with a chilling look at how jealousy, hatred, and regional pride can result in senseless violence and, in some cases, murder. The deaths of rap icons Tupac Shakur and The Notorious BIG brought public attention to the wars between the coasts, in particular their record labels, Death Row and Bad Boy respectively. While many believe the feud between the friends-turned-sworn enemies began over Shakur accusing Biggie of being behind a November 1994 murder attempt on himself, the story behind the souring goes back even further. Broomfield revealed that a joint viewing of Summerslam 1994 led to Biggie and Tupac disagreeing over the Bret Hart-Owen Hart steel cage match for the WWF Championship. The two apparently came very close to life-threatening violence that night, and Biggie even asked Tupac to leave before it got ugly. Broomfield acknowledges that the disagreement caused the unmended rift between the two. INDUCTION: Bikers’ Court with Jim Duggan – Hacksaw revs up his Harley for… Big Tobacco? Huh?